Alcohol Inks are new medium to me and I am still learning how to use them on my project. I searched some tutorials and ideas on Pinterests and watched severals videos on YouTube, too. And I decided to try them. I created some background on the other day using Ranger glossy cardstocks and also I tried them on HP Glossy photo papers. The results were vary and interesting. I still want to make more of these panels with mixing colors that I have right now 🙂 I made a card with one of the background panels that I created, you can check it out here. Today, I wanna share with you… these alcohol ink ornaments. I saw a YouTube video and the lady said that alcohol inks will work on any non-porous surfaces including plastic, ceramic, glass, etc. So, I decided to try them in glass ornaments. When we went to grocery shopping, I grabbed a box of these plain metalic ivory/milky white ornaments. And I did some experiments on them. I simply added the alcohol inks on the aplicator and then I added the Blending Solution, then simply tapped it on the ornament all around it until all surface covered. I did on 3 ornaments this time. I let them sit on apple sauce cups for about half hour to make sure they dried completely. After that, I hand-wrote and hand-drew on each of them with White Painters marker. I hope this can give you some ideas what to create with Alcohol Inks to play along with the Happy Little Stampers – Mixed Media Challenge this month. Check out more inspirations from the team on the blog and link up your project for a chance to win a gift card from the sponsor, Happy Little Stampers. Thank you for visiting me today! Have a fabulous day! beautiful ornaments. You have beautiful handwriting. I tried putting the alcohol inks inside a clear ornament – but got a blob – I will have to try covering the outside with the same color and see if I can save it. Barb, thank you 🙂 I saw a video on youtube from tim holtz that he used blending solution and blew it with sprit tool or you can use straw to spread the inks. Hope you can try it and save it. These are so elegant and creative Helen and I bet they will become heirlooms! The writing and doodling on the baubles is just perfect – so professional! Such a great idea, Helen! Love how they turned out and your handwriting is very beautiful! 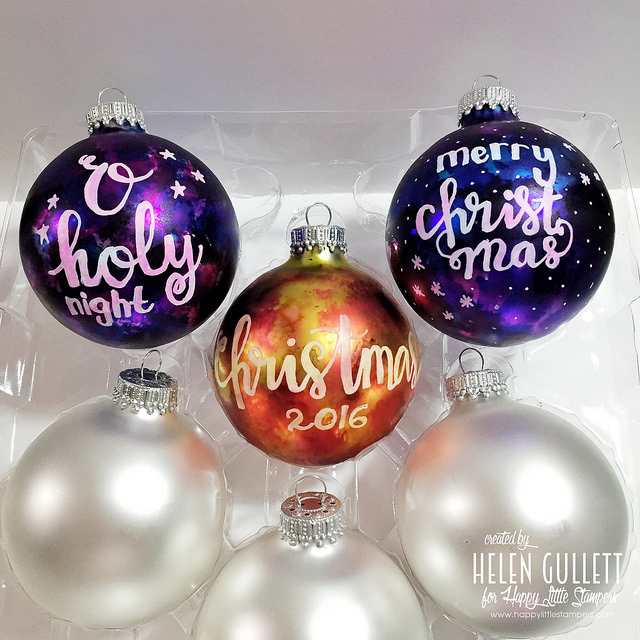 I love how you have altered the baubles with the alcohol inks – and your writing on them is superb! Great idea. So you can make your own color of ornaments you like. What a fun idea and amazing results, Helen! The ornament on the right is so gorgeous… a stunning sky! Wow..I am totally in love with these ornaments ! So vibrant and festive..your handwritten words make it even more beautiful ! These are AMAZING, Helen, wish my writing looked half as good as your does! !